My only previous encounter with Harold Pinter was through another play called 'Educating Rita' by Willy Russel. That was, and still is, a play that I hated, first of all because it was one of those plays that one of my teachers at high school pushed on us, and also because the main character, the teacher, was a miserable alcoholic. Then I stumbled across Bernard Shaw's Pygmalion and discovered that this Educating Rita was pretty much a modern version, and that the original was so much better. However, this isn't a discussion on Educating Rita but of one of Pinter's play, the first that I have actually seen (though I saw it on one of the National Theatre Live broadcasts). 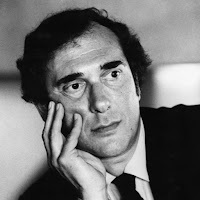 Normally I wouldn't have thought too much about Pinter, namely because in my mind he was basically that 'playwright from Educating Rita' and anything from Educating Rita wasn't going to be something that I would go out of my way to pursue. 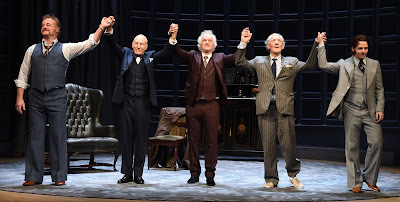 However, as I was walking past Wyndham's Theatre when I was previously in London I discovered that there was a play starring both Iain McKellan and Patrick Stewart. So, out came my phone and I checked the availability of tickets, only to discover that since it was the opening night there weren't going to be any. Actually, my understanding is that since this play stars a couple of really big names I suspect that you would need to book months in advance, and tickets aren't going to be cheap. As it turned out, when I was in London in 2013 the exact same theatre had another play starring another famous actor - Rowan Atkinson, and it turned out that the one day I was able to actually see the play was the one day that it wasn't playing (though, once again, I suspect I probably needed to book well in advance). I guess the next time I plan on going to London I should type the following question into Google: Are there any plays in London with famous actors? 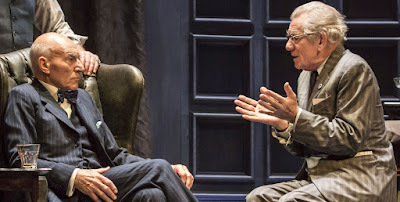 The first thing that struck me about this play was that it seemed to run along the similar line as a play by Samuel Becket - a single location, two acts, and what appears to be two people interacting in a way that makes them, and reality in general, appear to be quite absurd. 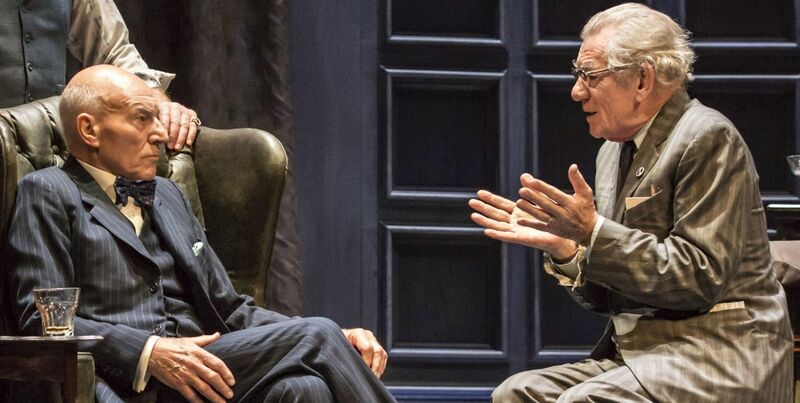 However, the more I think about it the more I feel that while there seems to be some influence by Becket in the play, Pinter seemed to have move on from where Becket was at the time of his writing. In a way No Man's Land isn't about the absurdity of reality but rather about the fears of where an artist, in the case of this play a poet, might land up. 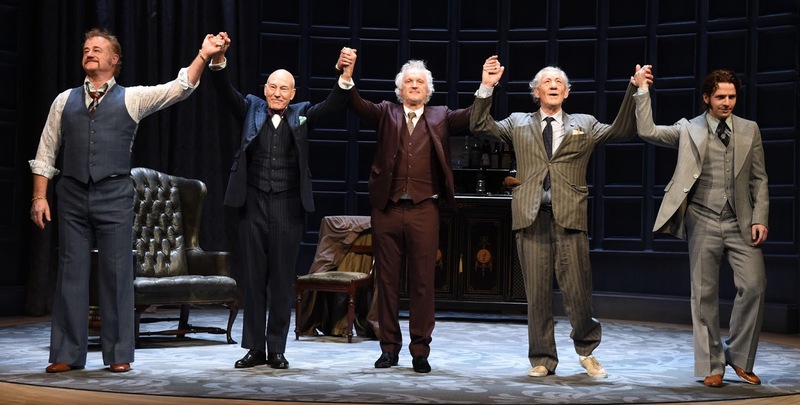 It is probably no surprise to know that Stewart and McKellan actually played the two main characters in Waiting For Godot, however unlike Godot, where the location seems to be incredibly vague, and the main characters to effectively be any man and every man, No Man's Land seems to have a lot more certainty. Sure, at the beginning there is some mystery as to who each of the four characters are, but it is clear that we know where the action is happening - Hirst's house in Hampstead - and the characters of Hirst and Spooner, and well as Briggs and Foster, have a lot more clarity. In a way they aren't so much anyman and everyman, they are characters with real names in a real location. Yet there is something of a mystery about these characters, at least when they are introduced. Sure, we know that we are in Hirst's house, and from looking at the house, or at least the one room in which the play is set, we known that Hirst is quite wealthy. However, beyond that all we have is Hirst sitting in the chair, saying very little while Spooner simply wanders around, regularly refilling his glass, and yabbering on about pretty much nothing. It is not until Hirst suddenly cries out 'No man's land ... does not move ... or change ... or grow old ... remains ... forever ... icy ... silent" and then crawls out of the room, that the mystery starts to take some form, namely because we have the introduction of the photo album, as well as two new characters, Briggs and Foster. It seems to be the case that the older we become, and the more distant the past becomes, that the less distinct it is. However, is the reason that our childhood is merely a vague memory because our brains are underdeveloped and thus less capable of remembering things, or is it that we are growing old, and our brains are deteriorating, that we begin to forget. Yet it seems that we are constantly trying to hold on to those memories, which is probably why we are forever taking photographs and buying souvenirs, as it seems that the things that we value the most are the memories that we hold. In fact when we lose someone close to us, our one great fear is that we will forget them, which is why we do whatever we can to keep those memories alive. I am sure we all know of a movie there the ashes of a deceased relative are dropped, and in the process destroyed. Then there is the idea of alcoholism, and the need for some people to drink to forget their pain. 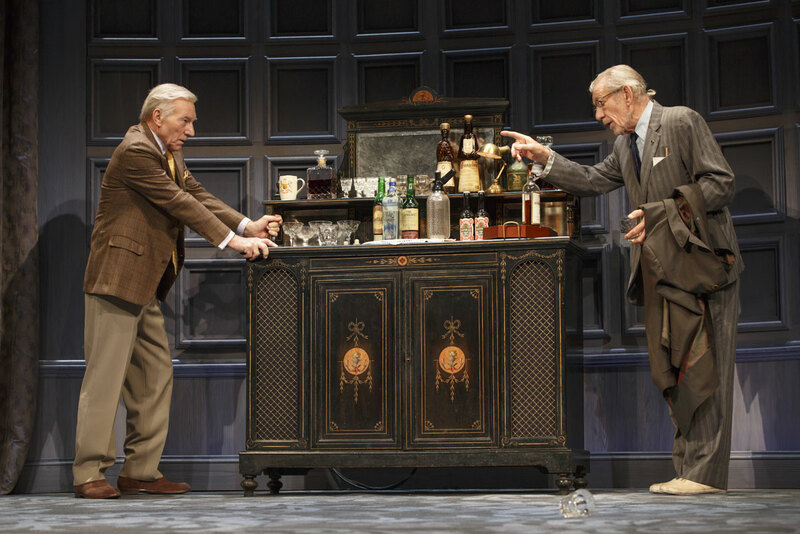 Throughout the play everybody is drinking. Hirst and Spooner arrive back at the house after meeting at a local pub, and continue their drinking session. When they wake up in the morning (surprisingly without a hangover) the first thing they do is drink, though they drink champagne as opposed to spirits, because one is supposed to drink champagne in the morning. In a way it is clear that they are alcoholics, but I don't think that is the point. Rather it is that alcohol not only dulls the senses but also dulls the memory, which is why it seems that at the beginning of the play everything appears to be rather hazy and fuzzy - the main characters are drunk, and in a way don't know who they are themselves let alone who the other is. Yet as it turns out they do know each other because they went to university together. However that was so long ago, and they had changed so much, that when they encountered each other again they were effectively mysteries to each other - to an extent. The thing is that Hirst is famous and has done well in life, whereas Spooner is exactly the opposite. Where Hirst worked for the intelligence service during the war, and became a successful poet, Spooner was on a ship, and basically has made ends meet by doing odd jobs here and there. The thing is that no matter how much he tries to hide his identity, it slowly, and eventually comes out, particularly when Briggs and Foster enter the scene. The idea of No Man's Land comes from World War I, in particular the Western Front. This was the area of land that lay between the trenches of the opposing forces and was termed as such because nobody controlled it. The thing with No Man's Land was that it was a muddy and treacherous place full of barbed wire and unexploded bombs, and any attempt to cross it would be met with bullets coming from the trenches and bunkers of the other side. Needless to say the chance of anybody returning after entering No Man's Land was slim, and you certainly wouldn't go there by yourself because to do so would most likely be a death sentence. So this is the case with Hirst. Sure, he is a famous poet, but he has entered this stage where his life has pretty much ground to a halt - in a way he is caught in this horrible terrain from which there is no escape. He cannot go forward, and there is no way that he can go back. Sure, he isn't in the situation that Spooner is in, but then again Spooner is also in a situation where he is also trapped - he is definitely past his prime and he has basically been surviving through whatever methods are available, yet he is literally a pauper with no way to escape where he has being - no wonder both of them have resorted to alcoholism. The interesting thing is that both of them seem to be able to offer the other a way out - Hirst moreso than Spooner - but Hirst is trapped, not so much by himself, but by his servants. In both ways, the way that Spooner offers Hirst a chance to attend a poetry reading, and then begs Hirst for a job - it seems as if Foster and Biggs now call all the shots. Hirst is going nowhere, and there is no way that Hirst is going to do anything to lift Spooner out of the sinkhole in which he has found himself. In fact the play ends rather suddenly, with no decision and no real conclusion - in a way it is left hanging there, letting us determine and work out how this impass is solved. In a way it is like that bus teetering on a cliff, with the thieves at one end and the gold at the other. Yet let us consider our own lives, how back at university we had such big dreams for the future. How we were going to go out and change the world, to do big things, and become great people. Yet here we are, years later, where our life has suddenly hit a rut. Sure, some are successful, like Hirst, some aren't, like Spooner - but both share something in common: life has reached a point where the best years are behind us and we have now entered the twilight realm, a realm where things become ever more darker and the chances of actually making a difference are ever more disappearing. Also, like Hirst, many of us a trapped by our servants, whether it be the mortgage we owe the bank, or the family that we have built around us - in a sense that time to take risks has passed, and now life simply seems to drift, and when we arrive at May Day we look back and wonder where that time has gone.